Welcome to the best homeowners insurance for Florida website. We tailor insurance policies for each client's specific needs here from our vast 37 company relationships. Getting a quote from us is a breeze. We don't need much information as you can see from the following form. 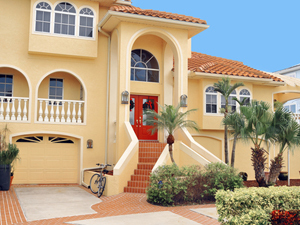 You will receive A rated homeowners insurance for Florida from us. Our main number is 352-200-2066. To receive your homeowners insurance quote Florida, you have the option to either answer the questions below or call us by phone. We'd be happy to hear from you. Our agents are efficient and accurate. We take care of the entire shopping experience for you right over the phone. You will receive your quote fast and there is no need to drive to any insurance agency offices. Understanding all the various coverage and insurance clauses associated with homeowners insurance for Florida can be difficult at best. We know there are many different companies and just as many types of insurance. Let RTC Insurance Advisors help you to sort through all the jargon. Get your free quote today. There are many different types of insurance policies available for the Florida homeowner. There are an equal number of clauses and exclusions of which anyone purchasing insurance should have a rudimentary understanding of. The basic package can be modified at any time, or completely customized depending on your insurance company. But, dwellings, adjacent structures, contents, liability, and medical payments cannot be excluded from even the most uniform policy. The most popular packages are for single-family homes are the Broad Form HO-2, the Special Form HO-3, and the Modified Coverage Form HO-8. These are the typical policies that most people choose to cover their houses and their belongings. These policies can protect against things like fire, wind and hail, explosions, vandalism, theft, or burst pipes. The more items you include in your insurance coverage the more expensive it will be. The actual coverage varies from company to company, and the rates also differ, sometimes significantly between insurers. Make sure you read all insurance documents carefully and ask your agent any questions you may have involving any type of coverage. The HO-3 form, which is also the most popular, covers anything that is not specifically excluded, and all homeowners insurance quote Florida includes liability. Renters also have coverage available, and purchasing renter’s insurance is a smart move. The renter’s insurance, or the HO-4 policy, protects your belongings and household contents and includes liability coverage as well. There are also policies available for condominium owners, the HO-6, and it includes liability and property damage as well. Some condominium associations offer coverage for your unit. You should request a copy of your association’s insurance documents to see what their policy includes before purchasing your own insurance. The materials you use in the construction of your home will have an impact on your homeowners insurance for Florida as well. One example of this is the difference between the cost of insuring a brick home and a frame house. A frame house cost more to cover than a brick home because it suffers from a greater risk of damage. The materials used in the construction of your home are something you should keep in mind when looking for insurance. There are a few exclusions from homeowners insurance for Florida as well. Typically flood or personal injury insurance is excluded from a basic policy and must be purchased separately. In Florida insurers are not required to offer you sinkhole coverage, but they are required to include catastrophic ground collapse coverage. Take the time to research the insurance you are interested in so that you choose the policy that best suits your needs. Talk to us and request a homeowners insurance quote Florida. Read all documents very carefully so that you understand exactly what to expect in the event you must file a claim.